The chances are, if you have just bought a new car, selling it for a good price isn’t at the forefront of your mind. However, inevitably, the day will come when it’s time to sell, and when it does – you’ll be glad you were organised. When it comes to car ownership, the single greatest cost is depreciation. That is, as soon you drive your car off the forecourt, it loses a great deal of value. And worse, it will continue to do so until the day you decide to sell. However, by taking good care of your car, keeping it looking good and running smoothly, you can ensure that its value will be way up when it comes to trade-in time. Read on for our 3 key tips on how to ensure the maintenance of your car’s value. One of the most effective ways of keeping your car in good condition and its value up is simply to keep it sheltered. Unfortunately, poor weather and changes in temperature can ruin bodywork and internal components, something which we know all too well with Britain’s unpredictable weather. If you have a garage, you’re probably already using it to park your car in. However, if you do have a garage but it’s being used as an overflow space, put cleaning it out at the top of your to-do list! It will save you time and money in the long run. While this might initially scan as trivial, since no one is driving around looking to scratch their car, it’s important to understand that careful driving is one of the best and simplest ways of keeping your car’s value up. Whether it was someone else’s fault or you were a couple of inches off the mark when parking, a cosmetic fault will not be taken lightly by a potential buyer, so it really does pay to be extra vigilant when out in your vehicle. While buyers will be keeping a keen eye on a car’s bodywork when assessing it for purchase, your car’s interior will be just as important. 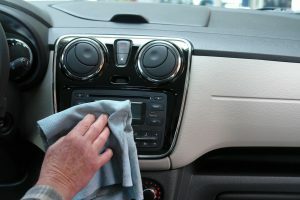 The appearance and smell of your car’s interior will have a huge impact on the buyer’s decision, so make sure that you keep your interior fresh and avoid smoking, eating and drinking in your vehicle. If you do eat and drink, however, make sure that you throw away the empty food and drink containers immediately, and clean up any spillages before they begin to create an odour. Munster Tyres provide a wide variety of car services to keep your vehicle running efficiently and, most importantly, its value up. Our fully trained, professional mechanics carry out quality car servicing, MOTs, repairs and replacements on all vehicle models. Our Fulham based garage offers high standard vehicle services and trustworthy advice to those across North London. Contact us today for enquiries, or to book in your vehicle.